All fruits are healthy fruits! They're rich in nutrients and antioxidants. They are a great replacement for candy and pastries--especially candy and pastries that we regret after eating and that never seem to really taste as good as expected!. Fruit is more satisfying and frequently just as sweet. There are many more kinds of fruit than you may think. Here's a list of some 90 edible fruit. Related fruits are grouped together. A technical note--these are culinary fruits, those typically thought of as fruit. Bottled juice can be healthy when it is "100% fruit juice" with no sweeteners. Sweet-and-tart pomegranate juice has the highest antioxidant potency of any juice in the supermarket. 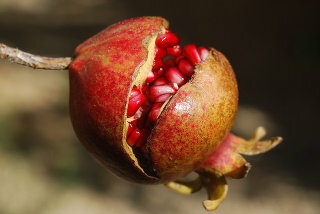 The health benefits of pomegranate juice include preventing atherosclerosis and fighting cancer. One clinical study used just 1.7 oz. daily of commercially bottled pomegranate juice to demonstrate thereversal of atherosclerosis. It's likely that such a powerful source of antioxidants is beneficial to everybody. Here's my review of Lakewood Juices pomegranate juice. 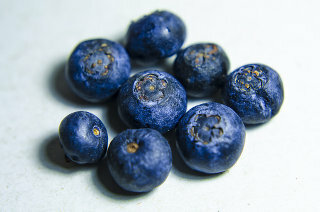 The blueberry is a common fruit with an uncommonly high ORAC (Oxygen Radical Absorbance Capacity) rating—that is a measurement of antioxidant potency used by the USDA to rate foods. 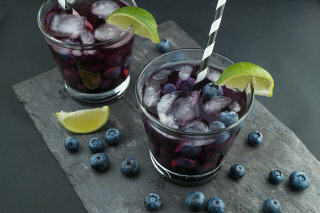 Blueberries are available fresh or frozen (for the best potency) and in juice. Read the amazing facts about blueberries! Fun and tasty plantains are THE FRUIT YOU FRY. 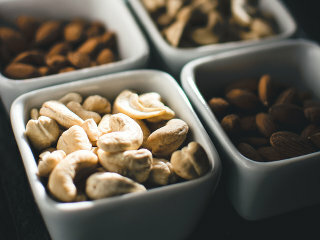 Nuts are technically fruits! No wonder fruits and nuts go so well together. Go to a juice bar. Two national chains are Smoothie King and Jamba Juice. Also, natural food stores frequently have juice bars. Buy a smoothie: fruit pureed in a blender, often with fruit juice, frozen yogurt, sorbet, milk, or soy milk. Go several times and try different smoothies until you find one you really like. Make your own smoothie in a blender. You could try to duplicate what you liked at the juice bar, or experiment. Ingredients that work well in a blender: bananas, strawberries, pineapple juice, orange juice. Just add ice, water, or yogurt if it gets too thick. Stay tuned for more on smoothies on this web site. 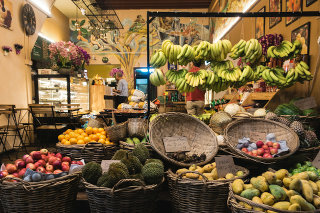 Natural food stores often have a good selection of dried fruit. Organic dried fruit has not been treated with sulfites (sulfites cause allergic reactions in some people). Look at the dates, figs, prunes, and raisins. Which appeal to you? Dried fruit is a healthy substitute for candy. Remember taking raisins to school? If you haven't eaten raisins lately, try them again. Try deglet noor dates: each are as sweet as a piece of candy but healthier. The more expensive medjool dates are thick and fleshy, with a distinct taste reminiscent of chocolate.